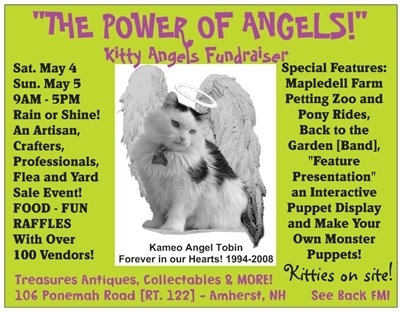 Description The 25th annual “Power of Angels, Kitty Angels Fundraiser” will be held at and hosted by Treasures Antiques, Collectables & MORE, 106 Ponemah Road in Amherst, NH on Saturday and Sunday, May 4 and 5. The event will run, from 9AM to 5PM, rain or shine. This fun and exciting fundraiser will feature over 100 artisans and crafters, professionals, food, flea market and yard sale vendors in a county-fair type atmosphere, complete with live entertainment. The bands “Back to the Garden,” “The 5 to 9 Band,” “Codaria,” “Roosta,” The Silvertones” and keyboardist/band member “Joey Peavey” are the musical performers. ‘Feature Presentation’ an interactive puppet display group with a make your own, monster puppet booth. Members of the Amherst Animal Hospital, who have helped Kitty Angels over the last 25 plus years, are scheduled to be on hand to answer any questions you may have about cats or any other animal. Mapledell Farm of Townsend, MA, a traveling petting zoo and goat rental farm will offer pony rides, bring alpacas, donkeys, goats and bunnies for petting, feeding and to greet the young and old. Some of the scheduled vendors include Sillie Puffs, Casual Cat, Royal Towne Fudge, Spirit of Cacao, Cutco, Dusty Finds, Break Free 603, Dippy Chippy & More, LuLaRoe, NewPro, Forever Clean Soaps, Follow the Quilting Bee, Farmhouse Naked Cakes, Clear Choice, Vinyl Revival Record Albums, Pet Pawlicy, Shire Enduring Creations, Hearts Design Jewelry, Anthony Acres Kitty Cat Farm, Willy’s Whirlies and Pampered Chef. Offerings will consist of, but not limited to pet supplies, art, jewelry, honey, jams and syrups, fudge, candles, soaps, florals, essential oils, sports memorabilia and sporting goods, clothing, minerals, fossils, handmade felt and wool products, yard items, various “yard sale” items and a great deal more. Featured throughout the fundraising weekend and into the month of June, is an electrifying raffle of numerous and diverse prizes including the popular and solid “Cat Tree” by Arubacat Cat Furniture. The multi prize raffle has always been successful in raising added funds for this event. All prizes are generously donated by local and national businesses, professional sports teams, private individuals and some of the on-site vendors. Kitty Angels, Inc. is the “pet” charity of Treasures’ owners, Rick & Sherry Tobin. To date, their fundraising efforts through these and other events are approaching $100,000 in cash and supplies. Kitty Angels, the sole beneficiary of these events at Treasures, is a no-kill cat shelter and is made up of all unpaid volunteers, dedicated to rescuing stray and abandoned cats and kittens, furnishing them with treatment for injuries or other health issues and then placing them into new forever homes with compatible owners. They are a non-profit, 501(C) 3 charitable corporation where all donations are fully tax-deductible and every penny of every donation is used in the caring of cats. (View their website at: www.kittyangels.org). If you’d like to make a donation, but can’t come to the event that weekend, you may send a check or money order to Kitty Angels Inc., P. O. Box 638, Tyngsboro, MA 01879. Please note ‘Treasures’ in the memo line. As always, you can drop off a donation at Treasures and they will forward it for you. The store is open 10AM to 5PM daily. Special Thanks go to Clark & Leighton, P.C. Dentistry, who donates a portion of their abutting land for these events. This popular and much sought after annual fundraising event will not only benefit the kitties, but will provide you with fun, outstanding bargains, food, ideas and knowledge. Please consider adopting a new, life-long forever-friend as well. Add The Power of Angels to your free online travel itinerary. Palace Theatre's Summer Series is back! Children's Summer Series at the Palace Theatre!